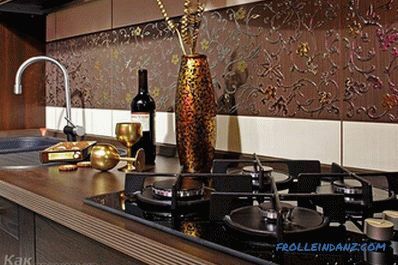 Modern kitchen is notable for its high level of comfort, as well as a large number of necessary devices, and a well-thought-out design. 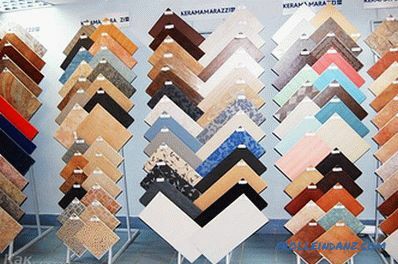 One of its strokes is an apron, for the manufacture of which different materials are used, but tile is most in demand. 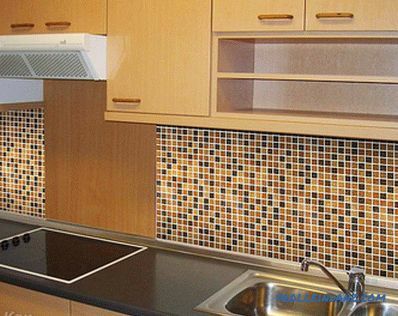 How to lay the apron of the tiles in the kitchen? 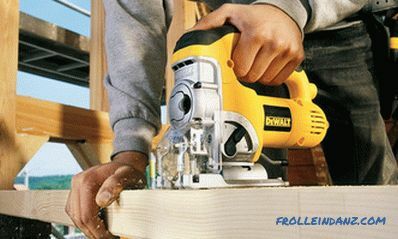 Is it possible to do this work with your own hands, without asking anyone for help? 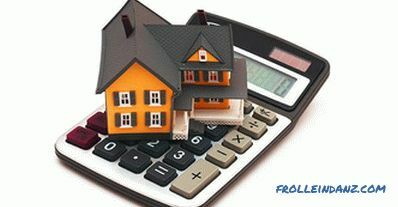 You will receive answers to these questions by reading the article. 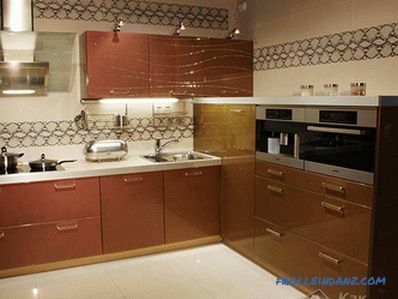 An apron is a working wall that is covered with decorative materials and is located between a worktop and cabinets. It is a good protection of walls against dirt and splashes. It is possible to choose the material of the right size for non-standard sizes. You can make an apron in the kitchen on your own. Such finishing work must be approached responsibly, realizing that if you do wrong actions, the apron laid out of the tile will not turn out attractive. It’s quite clear what I want do not just finish to protect the wall from fat. It must be something original. 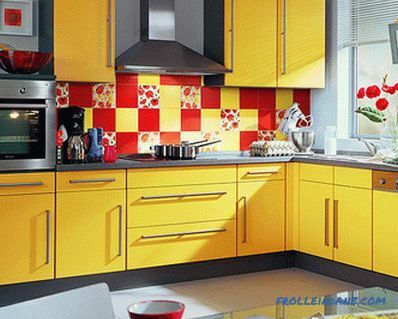 In pursuit of this goal, some people acquire very bright or unusually contrasting tiles. Here, as they say, "there is no friend to the taste and color," and we will not insist on our proposals. I just want to note that such a choice, subsequently, does not bring satisfaction and joy. It is better to give preference to low-key, soft tones. If you want to make a contrast apron, then it should be in harmony with the style of the kitchen. 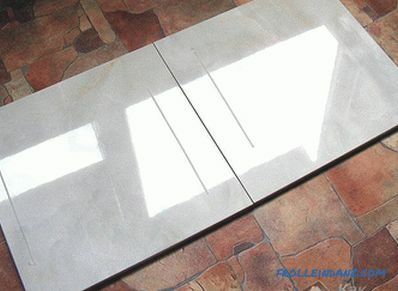 Of a large size, the size of the tile being purchased does not play, but it is easier to work with large-sized products. 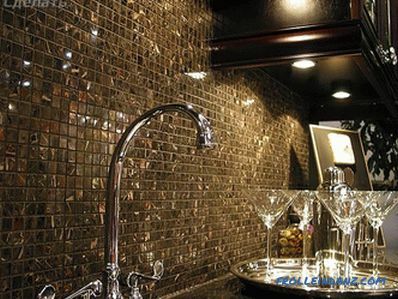 If you do not plan something unusual, such as a mosaic or a pattern, then it is most practical to purchase a facing material having dimensions of 20 * 30 cm. You also need to take into account the height of the apron. If it, for example, is 45 cm high, then it is better to purchase a tile of 15 * 15 cm (or 15 * 20 cm). Regardless of the size chosen, it is important to make sure that it is all the same size, symmetrical and not skewed. 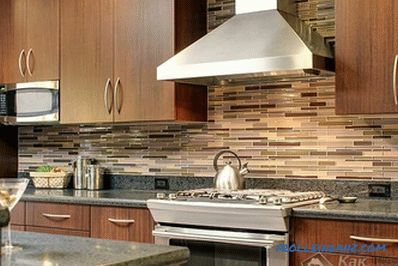 For making an apron best use a tile with a smooth surface, as to maintain the original appearance of the coating it needs to be washed regularly. Products with a raised surface will be much more difficult to clean. 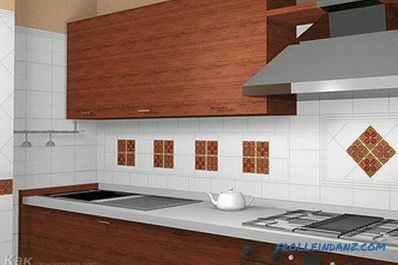 It is important to consider the working area between the stove and the hood. Most often the tile has to be cut, and some can crack. In order not to be distracted from work, you need to have a small margin - about 10% of the total amount of material. a SD profile (along the length of the apron ). primer for walls and for grouting. 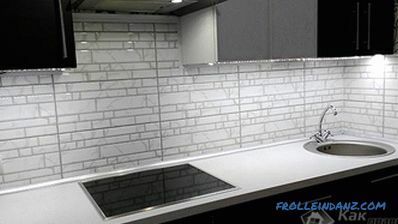 To tile It was laid down smoothly and did not fall away; you need to prepare the basis for its laying - a wall. Any lining should be removed. In this case, it would be nice if the work can be done with ease. It is necessary to check how flat the wall is, and, if necessary, align it. 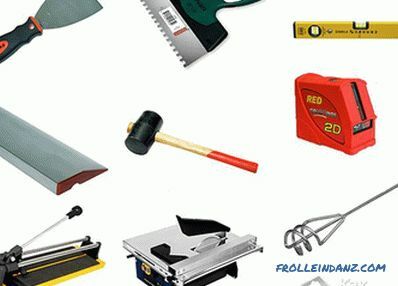 If there is a reliable coating, a lot of cuts are applied (with an ax or chisels), the presence of which will ensure good adhesion to the tile. If the plaster is crumbling, then you need to remove it to a solid foundation and plaster again. 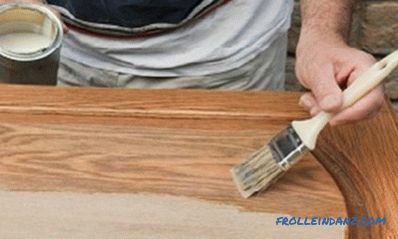 Now there is a lot of impregnations on sale, with which you can strengthen the existing coating without removing it. The situation needs to be assessed on the spot. 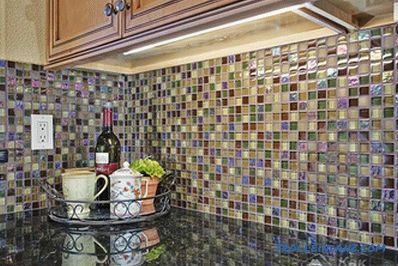 In the event that the sockets are located on the working wall, it is necessary to lay the wiring in the prepared strobe in advance and install the socket, taking into account that the tile will be laid. The wiring needs to be fixed in the strobe by alabaster and brought into one level with the wall. Measure the height of the tabletop and mark 2 cm below. While checking the level of horizontality, draw a line along the entire length of the apron. A more accurate result is obtained when using laser technology. 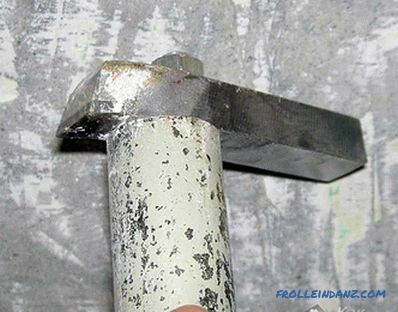 Below the line, fasten the profile to the wall and check its horizontal position. Mark the wall, considering the position of the plate and the hood. In the place where the apron will be organized, the wall should be opened with a primer and in a couple of hours you can start laying. 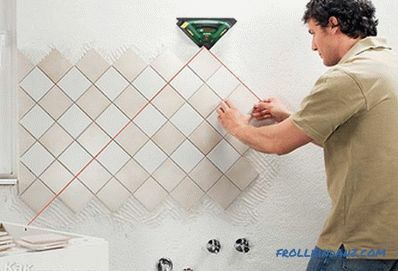 A quite reasonable question arises - how to lay the tile so that it turns out beautifully? This will be discussed further. It is more correct to start laying with a visible angle, but if this causes a substantial displacement of the apron relative to the hood, you can start from this part, moving towards the corner. In this case, something will have to sacrifice. If there is no experience in laying, it is necessary to dissolve a certain amount of glue in a small amount of water. The mixture is prepared by adding the dry mass to water with constant mixing with a mixer. It should be not very thick, but not spreading mass, which should be allowed to stand for at least 10 minutes. 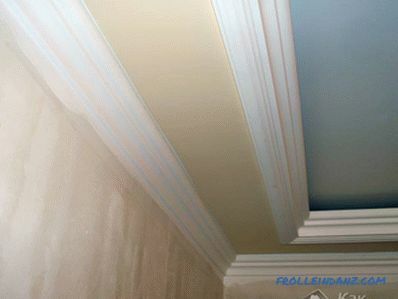 Many craftsmen put glue on the wall, stretching it with a notched trowel, and then applying tile on top and leveling it. 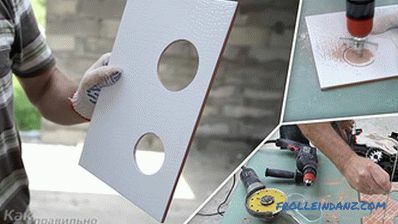 This method is not very good, as it turns out a very small area of ​​contact, and the tile may fall off. 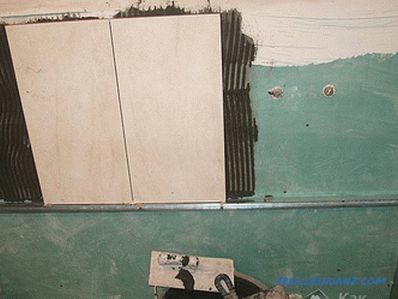 If, first, to patch the tile and wall with glue composition, and then apply the same composition with a notched trowel, then it will be possible to tear off the decorative coating only along with the plaster. If sockets are installed in the apron area, then in the tile diamond crown need to pre-make holes for them. Now you can proceed to the laying, checking the level, how exactly it is laid. The bottom row is installed on the profile, but the gaps must be observed by inserting the remote crosses. From the bottom, they are simply inserted one side between the tiles, and at the top, as expected. Since these additional elements will need to be removed after the glue has set, it is better to leave them closer to the outer edge. After the masonry is finished, the tiles need to be wiped off with glue, without exerting much effort, since it can move. An hour later, the crosses can be removed and the seams are cleaned from the glue, while it is still fresh and easily removed. 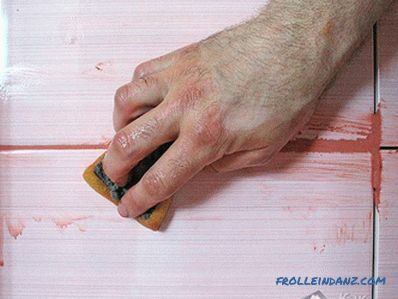 The next day, you can wipe the joints with a rubber trowel with a rubber trowel. At first glance, this work seems simple and it is. The difficulty in the other - to make the seams smooth and beautiful. This will help wet sponge (water should not flow from it). 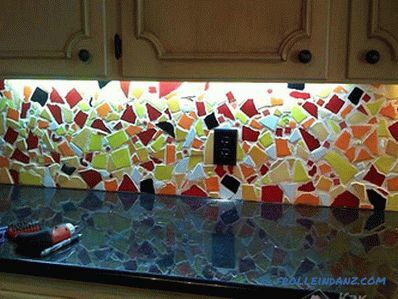 Light movements, like an artist with a brush, you need to stretch the grout beautifully along the seam. With a strong pressure on the sponge, a large layer of grout will be removed and you will have to apply it again. 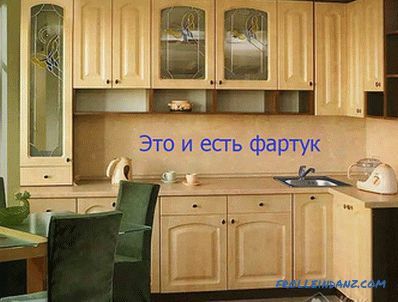 Since the apron is not flush with wall, then its edges can be puttied. 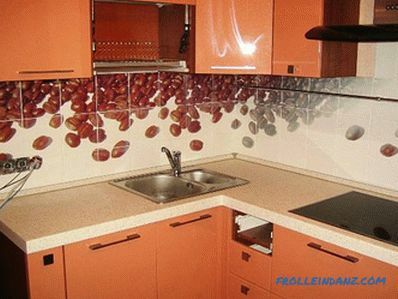 In order for the tile to shine, you need to rub it with a dry flannel. Now you can install furniture, hang closets and enjoy not only food, but also a pleasant atmosphere.